Posting an image on our forums is pretty simple. If nothing happens when you push the "Upload picture" button, then check to see if either 1) popup windows are disabled in your browser, or 2) the upload window might have gotten hidden behind other windows, such as your main browser window. 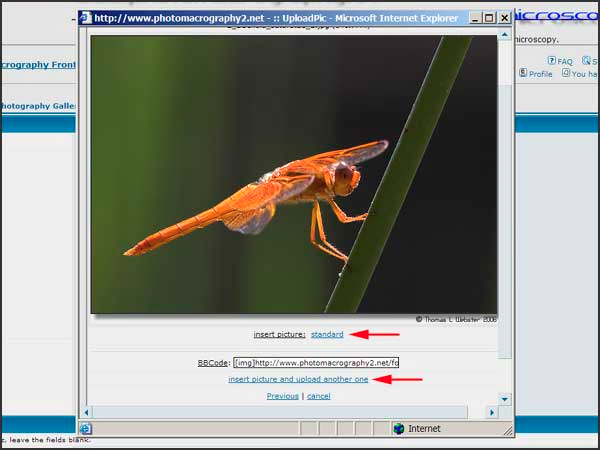 2) Click on the "Upload picture" button to open the image uploader screen. Click on the "Browse" button (red arrow) to select a file from your local hard drive to upload to our server. 3) Select the desired image from your hard drive and click the "Open" button (red arrows). 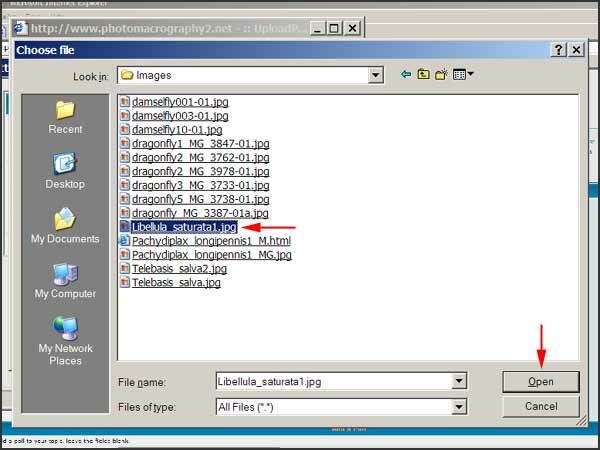 4) The name of the image file should now appear in the "Picture file" command line. Click on the "Send" button (red arrow) to upload the image file to our server. 6) The link(s) to your image(s), along with the proper BB code, will now appear in your message where you have inserted it. You can finish typing your message and submit your new topic or reply. The image you have uploaded will appear in your topic or reply when viewed from the forums/galleries. Be sure to check out your post using the "Preview" button before finally hitting "Submit" to make it visible to other people. One caution: there is a feature that at first glance looks like it may be useful, but actually it is not. 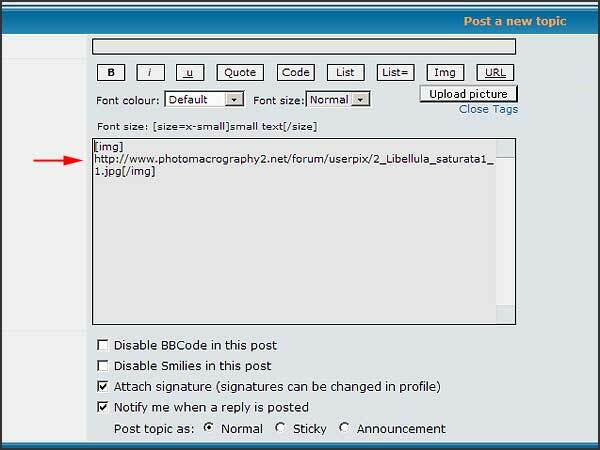 If the image on your PC exceeds the maximum image size for the forum, then the forum software will automatically and silently resize it for you. Don't be fooled! The forum software will indeed resize an overly large image, but the quality is very poor. It is much better to have the image sized properly before uploading. If the image dimensions are within limits, but the file size is too long, then the upload will be rejected with an error message, "Filesize exceeds limit." The image will not be automatically resized in this case. When both the image dimensions and the file size are within limits, then the forum will serve back an image that is bit-wise identical to what was uploaded. Images should use the sRGB color profile. Some browsers will correctly display other profiles, but many will not.